IF THIS BECOMES an Irish football resurrection under Mick McCarthy, let the records show that the Rock didn’t roll over by itself. The hosts defended doughtily, spending the first half with their backs to the Rock, flooding numbers around their own plastic Alamo before they were eventually undone by Jeff Hendrick’s first Irish goal since 2016. 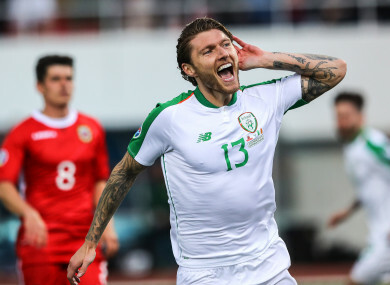 While Gibraltar defended well, Ireland’s attack was slow and laboured and attempts to switch play for James McClean perished amid fierce and entirely random bursts of insolent wind. Even allowing for the conditions, Ireland showed they have yet to shake off the problems that afflicted their attack in 2018, although David McGoldrick presence made a mockery of his latter-era exile under Martin O’Neill. Playing behind Sean Maguire, he was a lithe and physical presence all evening, but the goal came from his first opportunity to stand an opposition defender up. Finding space between the right-hand side of the Gibraltar defence, Conour Hourihane found him the ball. McGoldrick ghosted by a defender and pulled the ball back to Jeff Hendrick, who rolled the ball past Kyle Goldwin. It was a huge relief for Ireland, who had spent the first-half toiling. Their best scoring actually fell to a Gibraltar defender Goldwin, who celebrated as if he’d saved a penalty. In the World Cup final. Against Spain. In a shootout. Ireland’s best outlet was down the right-wing where Doherty and Coleman kept the ball on the ground and combined well, forcing a series of corners from which Ireland looked dangerous. Conor Hourihane’s deliveries were largely terrific, with Shane Duffy and James McClean inches from connecting at either post on separate occasions. The goal, however, didn’t come. Ireland’s frustration by this point was, as usual, best expressed by James McClean, who was booked on the stroke of half-time for a hefty challenge on Lee Casciaro. Four minutes into the second half, and that deadlock was finally broken, with Hendrick striking while their opponents were giddy. Roy Chipolina’s header from a corner was clawed away brilliantly by Randolph: the locals gasped in disbelief; the Irish sighed in relief. Those sighs were as strong as the wind by the time Hendrick wheeled off in celebration. Gibraltar were far from cowed, and made their numerical superiority in midfield count with a string of neat passes, lacking only an outlet up front. Ireland almost dug them out on this front, however, with sloppy passing handing Cascario a chance he bent narrowly beyond Randolph’s post. McCarthy responded by swapping Sean Maguire for Harry Arter, with Robbie Brady also making an early second-half appearance in place of Doherty. Gibraltar continued to enjoy plenty of possession, but restricted themselves to shots from distance, hoping that the wind might unsettle Randolph. It didn’t, and he remained an assured presence throughout. Shane Duffy and Richard Keogh were also impressive for Ireland, managing to judge the wind whenever it brought down hopeful punts forward. Keogh’s performance was made all the more impressive by the fact he played with a broken hand. Prior to kick-off, a banner critical of FAI CEO John Delaney appeared among the Irish crowd, and it popped up infrequently during the game. Its being moved in line with television cameras toward the end of the game led to a chorus of anti-Delaney chants from the Irish fans. Delaney was the last among the dignitaries next to the press box to take his seat before kick-off, making his way down the steps of the stand during the final bars of the Irish anthem. The Irish team will travel home with off-the-field noise whipping about their ears as fiercely as the Gibraltar wind. It won’t concern Mick McCarthy, however, as he and his players will merely say: Roll on Georgia. Email “Misfiring Ireland shake off Gibraltar and tough conditions to start Euro campaign with a win”. Feedback on “Misfiring Ireland shake off Gibraltar and tough conditions to start Euro campaign with a win”.